During the Age of Exploration, Europeans became aware of the relatively extreme forms of body art practiced in Sub-Saharan Africa. One of these forms was scarification, a body modification procedure that offered a sculptural quality to the skin. Sometimes a colored pigment was added to the incisions forming a kind of tattoo, sometimes not. 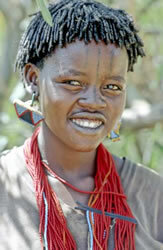 The Tsemai are an Omo Valley people of southern Ethiopia that practice tattooing which is called ­do-ey. I met young Elsa Mamo at a tourist rest-stop before the village of Weyto and she told me that “once I became a woman I got my facial tattoos.” Unfortunately, I had just a few moments with her and the only other information I could learn about her beautiful tattoos is that payment was a chicken, goat or some quantity of sorghum beer (depending on the size, form, and amount of tattoos), and that she was tattooed by a woman. In the old days, the neighboring Hamar who practice incredible forms of scarification believed that the Tsemai had karsama or lethal magic so they rarely attacked them. Photograph © Lars Krutak. Tsemai tattooing. Photograph © Michael Laukien. Because there were a plethora of meanings that were embodied within the sacred art forms of the skin, African body art moved far beyond the Western construct of “art” itself. For it represented a much wider corpus of knowledge and expression. This article takes an encyclopedic look at tattooing practices throughout Sub-Saharan Africa and includes the island of Madagascar. It focuses on many tribes that are rarely mentioned within the artistic canons of tattooing, and whose customs of body modification have a relatively undocumented history outside of obscure sources not widely available to the general public. Finally, it should be noted that this article is by no means complete as there are many other groups that practiced tattooing throughout the regions described here. So please keep in mind that this is a preliminary introduction to the subject and that future work by others will no doubt shed additional light on these incredible traditions of tribal body art. The Sahel is the ecoregion or transitionary climatic zone located between the Sahara desert in the north and the savanna grasslands to the south. It stretches across the African continent from the country of Senegal eastward to the Red Sea. One of the largest tribal groups that inhabitant the western Sahel region (from Senegal to Chad) are the Fulani, who are variously known as the Peul, Fula, Fulbe, or Felaata. These nomadic herders are gradually on the move throughout the year, searching for new pasture and water sources for their vast herds of cattle. Some groups have become more sedentary and have settled down in villages or towns where they practice agriculture, engage in market commerce, and have become devout Muslims. 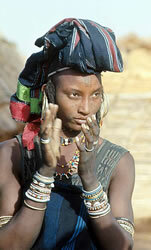 In the Fulfilde language spoken by all Fulani tribes, Wodaabe means “people of the taboo.” This moniker is appropriate because the Wodaabe are governed by a series of customary laws and behaviors passed down by their ancestors that emphasize humbleness and modesty, patience and fortitude, hospitality and physical beauty. Men also seek to repel bad luck through the use of many forms of talismans worn in pouches or placed in their turbans. Powdered tree bark, seeds, and leaves are believed to ward off evil words, enemies, or attract women and it is not surprising that throughout West Africa the Wodaabe are famous for their knowledge of maagani, secret cures both real and magical. 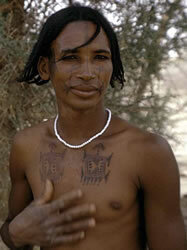 Wodaabe tattoos also reflect this magic because many symbols are associated with fertility or are employed as charms (toggu) to increase a man’s or woman’s beauty. Other marks are believed to hold medicinal cures. 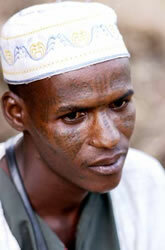 I myself have encountered “magical” tattooing among the Peul in northern Benin. In a Bétamarribé and Waama village on the outskirts of Natitingou, I met Yaseku and his son Umaru – both Muslims – who dwell here during the rainy season. 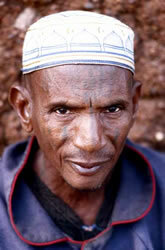 Umaru told me that he received his facial markings when he was eighteen years old. 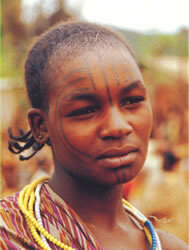 The Peul call tattooing tchouti and a series of facial markings cost 500 Francs or roughly $1.00. Peul tattoo artists can be male or female and the motifs were pricked in with a sooty pigment. Umaru said that the Peul tattoo for beauty which is not surprising because these distinctive people wear bright dress, much jewelry, and even facial makeup. As noted, the Fulani are famous throughout West Africa because they are nomadic cattle herders who cover great distances in the dry season in search of water for their herds. Perhaps this is why Peul men are intricately tattooed so they might impress those women they meet during their long journeys through Benin, Burkina Faso, and Niger. However, Yaseku noted quietly that he believed his tattoos also protected him from evil spirits (jinn) lurking in the landscape.